Stevenage Reserves won the Eastern League Division 1 South at Harlow Town FC in midweek. Stevenage Reserves secured their divisional title, Billericay Town, Chesham United and FC United of Manchester could all follow suit shortly, while Hassocks lifted their League Cup. 1 NORTH – Wymondham Town are one match away from an unbeaten campaign, the title-winners beating Histon away with Hannah Waters getting the only goal. 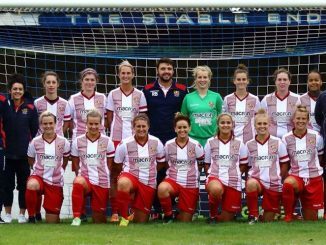 1 SOUTH – Stevenage Reserves took the title with a 3-2 midweek victory at Harlow Town where Daniela Martucci bagged a brace but followed that up with a 2-0 loss at Little Thurrock Dynamos. Harlow Town all but sealed the runners-up spot with a 5-1 result at Hutton, Tayla Handscombe and Lily Bruno with two each. Hoddesdon Town Owls’ Rosy Wadhams came off the bench to score twice in a 5-1 win at Bishops Stortford. 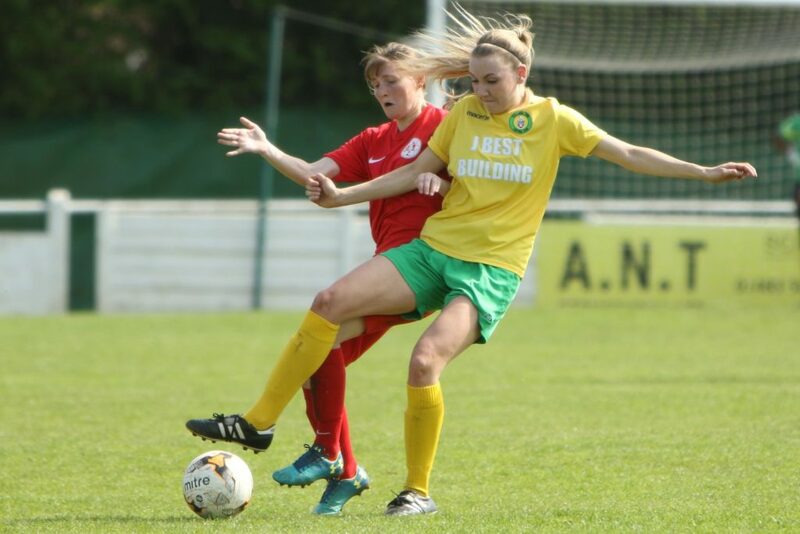 PREMIER – The top four all won but Leicester City WFC DS can no longer finish in first place, despite their 3-1 result at Rise Park where Gabriella Reid got a treble. Leaders Nettleham came from a goal down at Eastwood to run out 5-1 victors. Oughtibridge War Memorial came away from Kettering Town 3-0 winners, unbeaten Peterborough Northern Star saw off Mansfield Hosiery Mills 3-1. 1 NORTH – Arnold Town DS defeated top of the table Hykeham Town 2-1, Natasha Leach and Katie McCrorie with their goals. Alice Hayes struck three times as Lincoln Moorlands Railway hit hosts Clifton 6-1 and Grimsby Borough’s 5-0 success at Teversal included a double by Lydia Clark. 1 SOUTH – Peterborough United held first position with a 7-1 win at Desford, Oadby & Wigston Dynamo put a dozen past Corby S&L to keep right in contention, Nikki Lidgett netting three times. Northampton Town thrashed Loughborough Foxes Vixens 13-3 with an eight-goal haul for Emma Dunmore but the title may now be beyond the Cobblers. AFC Leicester leapfrogged Corby Town into fourth when overcoming them 3-1. 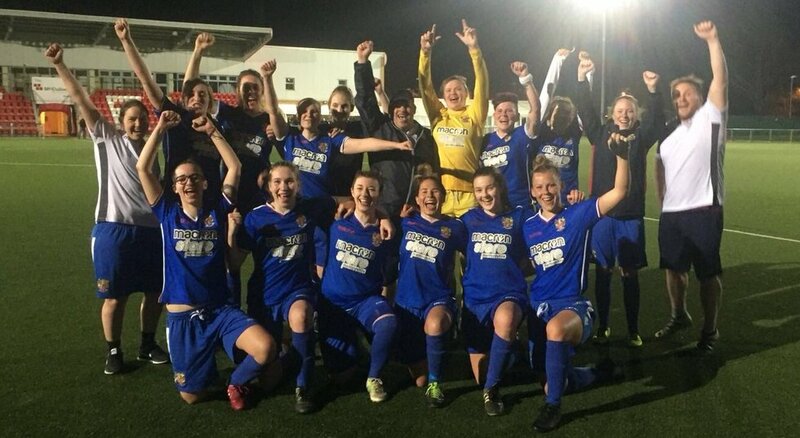 PREMIER – Newly-crowned champions Crawley Wasps finished their league campaign unbeaten with a 5-1 score over London Kent Football United, Faye Rabson netting three times. The result also confirmed AFC Phoenix as runners-up. GREATER LONDON PREMIER – Regents Park Rangers went sixth with a 4-1 defeat of AFC Wimbledon DS, Kate Inwood on target twice. Shannon Drew’s hat-trick for Spurs DS was not quite enough to secure all three points, as Hampstead held their hosts to a 5-5 draw. JOHN GREENACRE MEMORIAL CUP SEMI-FINALS – Ashford Town (Middx) progressed to the final with the best of five goals at Hemel Hempstead Town and Godalming Town joined them by edging Islington Borough on penalties after being deadlocked at 1-1. SOUTH EAST COUNTIES PREMIER – Meridian finished their fixtures with 3-0 & 2-0 wins over Chichester City DS to go top, Amy Russ and Zara Roots both with braces. However, Kent Football United remain strong favourites for the title after deafeating Eastbourne LFC 3-1 and another success next week at home to Worthing will see them champions. Herne Bay and Crawley Wasps Reserves exchanged 2-1 wins, while Ashford beat Bexhill United 4-2 aided by a couple from Kayleigh Harris. 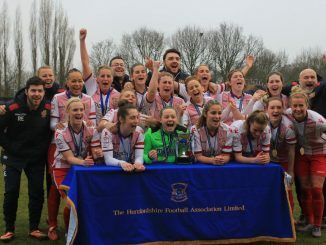 LEAGUE CUP FINAL – Hassocks lifted the cup after a 3-1 victory against Worthing at Maidstone United FC, Billie Phillpot playing a crucial part with two goals. PREMIER – Durham Cestria walloped Wallsend BC 15-0 and Megan Elliott top-scored with four to help keep them ahead of Norton & Stockton Ancients, whose 8-1 result against Castleford White Rose saw Nyci Thorns and Courtney Corrie with three apiece. York City’s Nichola Brown netted four out of the thirteeen conceded by Wakefield, while Farsley Celtic posted a 3-1 result at RACA Tynedale. 1 NORTH – South Shields stayed five points clear when winning 3-0 at Blyth Lions, second-placed Boro Rangers edged Consett 1-0 through Larissa Burkinshaw’s effort. Guisborough claimed only their fourth point when sharing four goals with Cramlington United. 1 SOUTH – Harrogate Railway rose to second with a 4-2 defeat of Doncaster Belles and Malet Lambert edged Altofts by the odd goal in three. 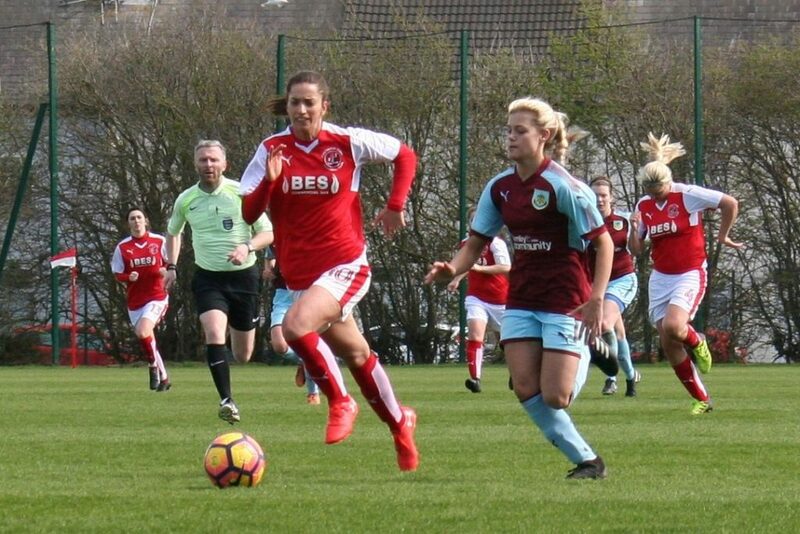 PREMIER – Tranmere Rovers wrapped up their fixtures with a 4-2 win at one of their title rivals Wigan Athletic but second-placed Burnley remain in a very strong position, having scored three without reply at Fleetwood Town Wrens including a Leah Ambley brace. MSB Woolton and Accrington Sports shared six goals, Sir Tom Finney tied 2-2 with Merseyrail Bootle but were overtaken on goal-difference by Manchester Stingers after their 2-0 win at Blackpool. 1 NORTH – Cammell Laird missed the chance to replace Penrith at the top, beating Bolton Wanderers U-21 Reserves 2-1 but losing by the same score in the other half of the double-header. Carlisle United climbed to fourth by beating Morecambe Reserves 7-2 away, Gillian McGimpsey (4) and Kerri Mallinson (3) dominating the scoring. Bury banked four points from two games with Workington Reds, winning 2-1 and drawing 0-0. Burscough Dynamo did similar against Leigh RMI, finishing 2-0 and 3-3. 1 SOUTH – FC United will be promoted if they win at Curzon Ashton on Wednesday, after Liverpool Feds Reserves finished their fixtures with a 1-0 win over second in the table West Didsbury & Chorlton. Altrincham stayed a point better off than Stockport County Blues when drawing 1-1 with them and Crewe Alexandra DS sent City of Liverpool to an 8-0 defeat, assisted by Sarah Gill’s three goals. ARGYLE SPORTS CUP SEMI-FINAL – FC United eased into the cup final by sinking CMB 6-0, Jess Battle banging in five goals in front of a crowd of over 200 at Broadhurst Park. PREMIER – Oxford City made Chesham United wait a little longer for the title with a 10-0 win over Winchester City Flyers, Lauren May making half that tally. The leaders will be champions if they avoid defeat at home to Oxford on Thursday. 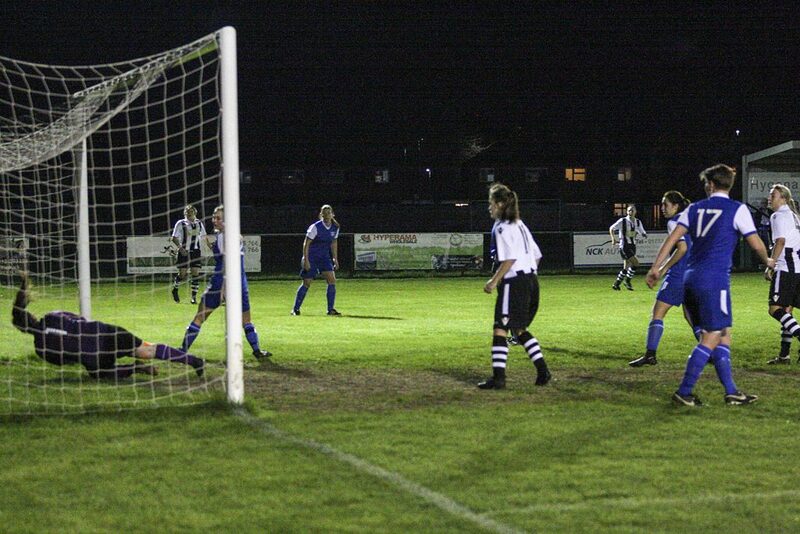 Shanklin were beaten 2-1 at home by New Milton Town, for whom Holly Sandiford got both goals. 1 NORTHERN – Wycombe Wanderers won a seven-goal thriller with Oxford City Nomads to go fourth in the table, Tara Woodward with three of their goals. 1 SOUTHERN – Jade Hockey’s first-half double saw leaders AFC Bournemouth win the top of the table clash at Warsash Wasps 2-1, while Southampton WFC Reserves drew 1-1 with Alton. PREMIER – Buckland Athletic made it sixteen straight wins with 6-0 & 5-0 scores against Bishops Lydeard, Kirsty Caunter with five goals overall. Title rivals Marine Academy Plymouth returned from Ilminster Town with a 2-1 victory, Sam Drewery scoring twice. Exeter City picked up two points at Charlestown with 1-1 & 2-2 draws, Middlezoy’s Anusia Rourke ran in three goals in the 5-1 result at AEK Boco and Marika Niekuwal scored 3 minutes into each half as Forest Green Rovers won 2-1 at Downend Flyers. 1 EASTERN – Portishead protected their leadership with a 3-0 win over Frome Town but Wootton Bassett Town stayed right on their heels after a walkover against Cheltenham Town DS. Title-chasing Almondsbury got all three goals in the game at Swindon Spitfires, Team Mendip’s Ellie Oritt and Ellison Roberts bagged two each in the 5-1 result at Cheltenham Civil Service. Oldland Abbotonians overtook FC Chippenham when edging them 4-3 away, Jade Scammell scoring twice for the visitors. Swindon Town DS netted nine at St Nicholas Reserves, Kathryn Bach, Milly Colford and Meghan Larkin all contributing doubles. 1 WESTERN – Callington Town just about made it a dozen wins on the trot, with the best of seven goals at Alphington, while second-placed Plymouth Argyle Reserves rescued a point at Plympton with an Alex Hugh equaliser. Exeter & Tedburn Rangers edged Bude Town 2-1 and Activate conceded their fixture with Newquay Celtic. PREMIER – Unbeaten Leafield Athletic replaced Bedworth United at the top when winning 2-1 at Kingshurst Sporting Club. Crusaders knocked over Knowle 8-2 with the help of an Ellie Gibbs hat-trick, lowly Leamington restricted Lye Town to a 3-2 win and Stockingford AA Pavilion were awarded the match with Worcester United. 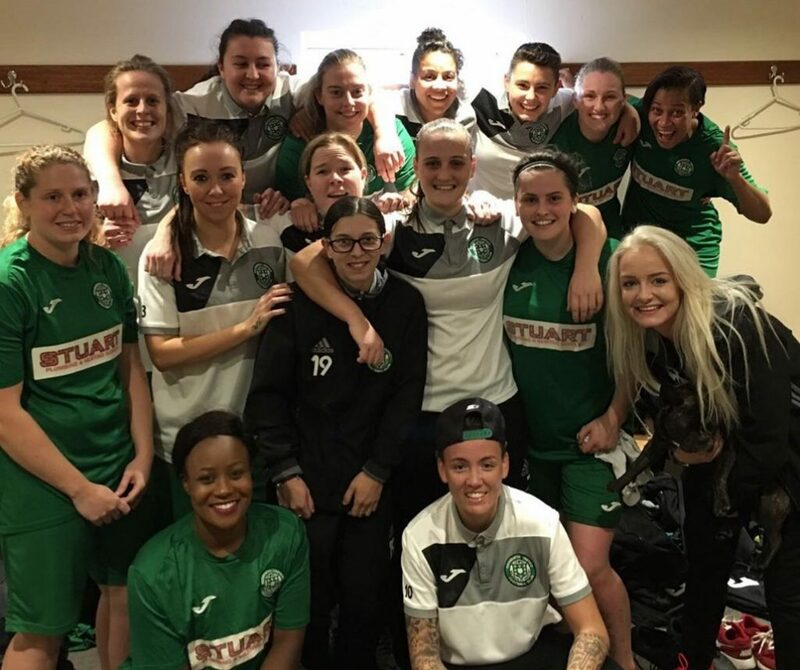 PREMIER CUP SEMI-FINAL – Bedworth United went through 5-3 after extra-time at Coundon Court, Jodie McGuckin with two of their goals. The league has it’s Cup Finals Day at Stone Dominoes FC this Sunday (29 April), with the first match at 10.00am. 1 NORTH – Sutton Coldfield Town increased their chance of the championship while damaging that of Goldenhill Wanderers, whom they defeated 3-0 away. Leek Town’s hopes of finishing first are slim and they all but ended Shrewsbury Town’s with a 1-0 away win. Florence are off the bottom thanks to a 4-1 win in the basement battle with Atherstone Rangers. 1 SOUTH – Redditch United passed up the chance to take Gornal’s top spot when going down to a 3-2 loss at Solihull United, their first reverse of the season. Coventry Sphinx added to their challenge for the leadership with a 6-1 success at Kidderminster Harriers, where Lucy Stevenson was twice on target.